With sunny and pleasant weather extending well into fall, October is still an ideal time to escape your everyday routine and head to Pawleys Island for a relaxing weekend vacation! And since the lowcountry enjoys warm weather during autumn there are plenty of great fall festivals that will fill your Pawleys Island vacation with wonder and excitement. 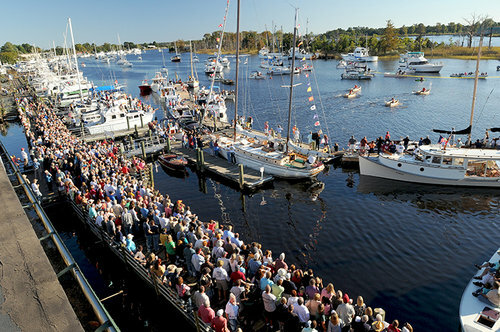 One such festival takes place during the third weekend of October as the Wooden Boat Show returns to the historic waterfront district of Georgetown for its 29th year. If you’ve taken a vacation to Pawleys Island but never made the short drive south to Georgetown you’re really missing out! With a beautiful waterfront area rife with unique shops, museums and restaurants, it makes for the perfect day trip on your Pawleys Island getaway. Even better, if you’re in the area on Saturday October 20th or Sunday October 21st you will be able to catch the Wooden Boat Show, one of the biggest festivals to take place each year in Georgetown. As you walk through the scenic downtown area, over 140 wooden vessels will populate the waterway and the banks along the water. The boats on display will span all sizes and types, from small single-person kayaks to sailboats. In addition to all the watercraft for your perusal, a packed slate of events and activities will keep the action going all weekend long. On Saturday, events include a wooden boat-building challenge where teams have only a few hours to craft their own boat and race their competitors across the Sampit River. Kids are sure to love the interactive exhibits available including knot-tying seminars and a model boat building area. Sunday will feature two very different but equally fun races. Sailors from 8-15 years old can take part in the Opti Pram Regatta, navigating a course at Francis Marion Park in their watercraft. Meanwhile, the 3rd annual Cardboard Boat Regatta challenges team to craft a boat completely out of only corrugated cardboard, tape and waterproofing. Along with all the fun demonstrations and races, a plethora of food vendors will be around the festival grounds offering lowcountry favorites like shrimp creole, chicken pilau and BBQ and two entertainment stages will showcase live music both days. With so much history, fun, food and entertainment packed into the weekend, the 29th Annual Wooden Boat Show in Georgetown is sure to be a fantastic time for all who attend. And if you haven’t planned a fall weekend trip to Pawleys Island there are still amazing accommodations available at our first class resorts: Litchfield Beach and Golf Resort, True Blue Resort and Pawleys Plantation Resort. Best of all, the Litchfield Company has special deals for booking standard rooms and suites at Litchfield Beach and Golf Resort during the Wooden Boat Show! Visit our specials page for full details and plan your fall getaway to Pawleys Island today!